Student housing: is there room for more? There were between 4,000 and 5,000 beds dedicated to students across 20 projects in the previous year, according to a JLL research. Nine of the projects are located off campus but are university affiliated, eight are on-campus and three are private purpose-built student accommodation (PBSA). Most of the off-campus accommodations and PBSAs are located in affordable residential communities and close to higher education providers, including Discovery Gardens, Al Barsha, Jebel Ali, International City, Dubailand and Dubai Silicon Oasis (DSO). The purpose-built premises of the American University of Dubai (AUD) in Dubai Media City can accommodate 536 students, according to Simon Townsend, head of valuation and advisory and consulting at CBRE Middle East. Heriot Watt, BITS Pilani and ITS/Amity also have dedicated accommodation in Dubai International Academic City (DIAC). “Other universities have chosen instead to purchase or to long-lease apartment buildings to accommodate their students, such as the Canadian University residences in Discovery Gardens,” says Townsend. 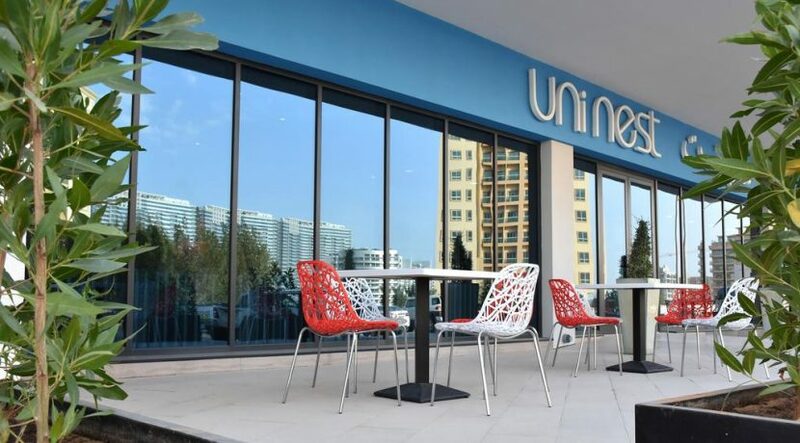 Dubai’s growing popularity as a university/higher education destination in the past decade has been the primary reason for the development of the student accommodation sector, according to Magon. “Though nascent at this stage from a PBSA perspective, they have emerged over the last two to four years catering to the demand of the ever-mobile international student community,” he says. The recent opening of The Myriad in DIAC has thrown the spotlight on the opportunities to build integrated student housing complexes in the emirate. The Myriad will add over one-third of current supply, a substantial 1,820 en-suite rooms, coming in different sizes. It will be ready by 2020. “While there is a small number of purpose-built student accommodation facilities existing in Dubai, much of the demand is accommodated within residential buildings separate from university campuses, including within more affordable locations such as International City, Dubailand and Dubai Silicon Oasis DSO,” says Townsend. The Myriad will be the fourth PBSA in the emirate. The DSOS University Residence in DSO has studios and shared three-bedroom apartments, with sporting, retail and social facilities. The Etisalat Academy Residence in Muhaisnah offers 240 hotel-style rooms, with a lot of sporting facilities. The Uninest Residences in Dubailand, just across Al Ain Road from DIAC, operates 242 rooms. Townsend says various developers are now considering developing student accommodation in locations such as DIAC, “looking to emulate the success of Uninest, which was sold last year to ENBD REIT under a sale and lease back agreement”. Rooms at Uninest are available in three- to seven-bedroom configurations. Private single rooms and studios are also available. Prices range from Dh2,650 to Dh5,800 per month. “Given the demand for Sharia investments in the Middle East and the significant volume of outbound capital into the student accommodation sector in more mature markets in the US and Europe, we expect institutional investment volumes will increase as the sector matures, and as more and better-quality facilities are developed,” says Townsend. Magon concurs that quality PBSAs with a reputed operator offer a good investment opportunity, particularly in light of Dubai being home to the highest number of international branch campuses in the world with a total of 31, and multiple new higher education campuses expected to commence operation soon. Townsend cites KHDA figures to predict future demand for student accommodation, which was closely linked to the growth and utilisation rates of university places. The Myriad is a first-of-its-kind integrated student housing community and the largest student housing facility on a single 58,000 square metres plot in the UAE, says Vikram Rao, CEO of The Strategic Housing Group (SHG), which has teamed up with Asset Campus International, the largest US student housing firm, to develop and operate The Myriad. “We’ve been working on this project for over three years. It’s become truly an investment-class student housing project, a viable opportunity to cover the cost of studying and housing for students from abroad,” remarks Asset Campus Housing’s Steven Mitchell. The Myriad Dubai project is financed through FIM Partners, a Dubai-based investment management specialist. “Globally, student housing as an asset class has historically had a low correlation to other traditional real estate asset classes and has proven to be an effective diversifying addition to a real estate portfolio,” says Fares Bou Atme, vice-president of real estate at FIM Partners. Rao says that although funding was in place, a bank might be engaged in financing in the future. And while student accommodation is a good investment asset, Rao says it is not for those who are after quick, high profits.